Prime Minister Voreqe Bainimarama yesterday presented the Champion of Change Award at World Oceans Festival at Governor’s Island, New York to Dr. Wallace J. Nichols. According to Prime Minister Bainimarama, Dr Wallace is a scientist, a marine biologist, an explorer and author of the bestselling book: “Blue Mind; The Surprising Science That Shows How Being Near, In, On, or Underwater Can Make You Happier, Healthier, More Connected and Better at What You Do”. He said he was delighted to be making a repeat visit to New York and also to Governor’s Island, where he came for a training course with the US Coastguard when he was in the Fijian Navy back in 1981. 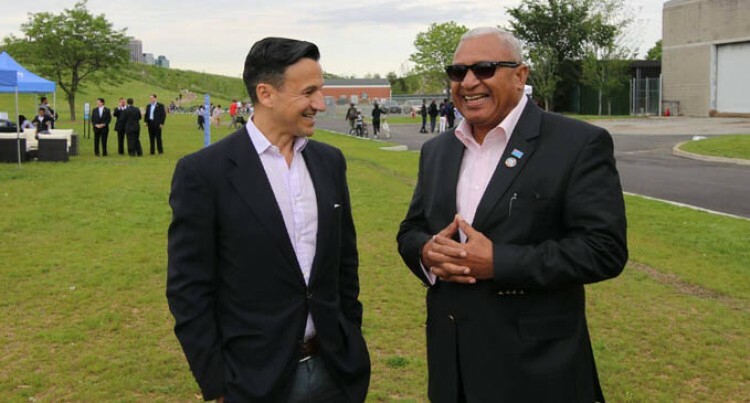 He said he wanted to say how much he valued the great friendship between America and Fiji and especially the great friendship between Fijians and New Yorkers. As incoming President of COP23 and also co-host of the UN Oceans Conference this week, he thanked the Mayor and people of New York for standing shoulder to shoulder with Fiji on this issue. In fact he said it affected every person on earth, just as the health of our oceans and seas was critical to every human being and is why we they were all gathered there.